Real Time Gaming decided to gladden the hearts of all those rockers who like to wiggle their behinds with the sounds of Chantilly Lace and The Wight Lightening, songs that were mostly popular in 1950’s, also known as the Golden Age of Rock. This 2016 release will take you back in time, thanks to its retro appearance which will make you wish to put some grease on your hair and wear your old leather jacket and pilot sunglasses. Even though J.P. Richardson Jr., or the Big Bopper, died very young on “The Day Music Died” without having a proper chance to enjoy his popularity, RTG are making sure that this rock singer, disk jockey and song writer will not be forgotten with their new product. So come down to the theatre and look for your “big-eyed girl with a pony tail that will make you act funny and feel real loose like a long necked goose”. The slot is set in a theatre where singers of the specific time used to perform. The reels are populated with authentic symbols from 1950’s, so gamers will come across the Golden Record, Jukebox, Microphone, Gramophone, 12’’ Vinyl Record, a Guitar, an old Radio, a Phone and a Note. Big Bopper himself is answering the phone in this game, functioning as a full-reel Wild which will triple all your winning combinations. You will also find signed pictures of Mr. Richardson, lipsticks, Coca-Cola bottles and that famous black comb every hotshot wore in his pocket. In combination with a bunch of special features and an enjoyable gameplay, followed by a cute soundtrack, the RTG title is bound to become very successful. The Big Bopper is a six-reel slot which offers 729 ways to win. Before starting to spin the reels, do chose the bet value, going from $0.03 up to $7.5 for a single spin. The Big Bopper is the most important symbol in the slot. This full-reel Wild can be landed on reels 2, 3, 4 and 5, replacing all other symbols except Scatter. All the winnings combined with the Big Bopper will be tripled. The blue neon sign placed on the right side of the slot can provide all information about the paytable, rules of the game and special features. 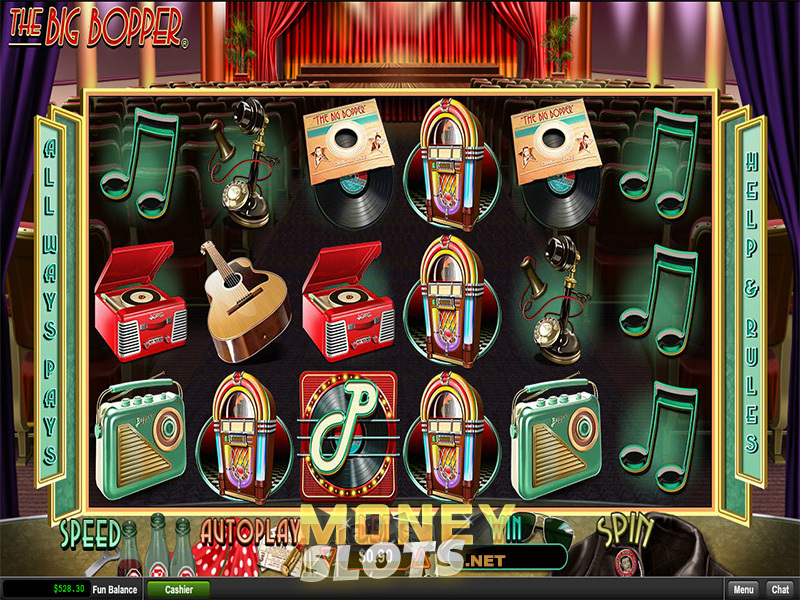 Players can also adjust the speed of the reels by clicking on the Coca-Cola bottles placed next to the Autoplay. The White Lightning appears in the Bonus Round and is the highest paying symbol in the slot and six of a kind is worth 2,000 coins. In combination with the Big Bopper Wild, the amount is tripled. Concerning the base game, the Golden Record gives 1,000 for six of a kind, and it can also be tripled with a Wild. You need to land all six of the BOPPER Scatter letters to trigger one of three Bonus Rounds. A minimum of three letters from left to right and vice versa will trigger the respin mode and with a bit of luck you will win the bonus. Big Bopper Instant Win gets x20 multiplier, but can rise up to x250, depending how long J.P. Richardson Jr. sings Chantilly Lace. Next in line is Chantilly Lace Free Games round, rewarding players with as much as 45 free spins and an x10 multiplier. White Lightning Free Games pay the most, since BOPPER letters are replaced with the Wight Lightning symbols, so expect hefty payouts. Do not overdo with the initial bet, since it might happen you will spend all of your money before the show is over. If you want to play the slot, and your desktop is not near, do not worry, RTG made sure that their product can be started on iPhones, smartphones and tablets, with practically no difference in gameplay. Thanks to several interesting extra features and some top notch graphics and a cute soundtrack, Big Bopper slot will be one of the biggest hits this summer. The 1950’s are coming back in style, because RTG babies know what we like!